It's been a while since i explored the Farrer Park area since i moved out of the North Eastern part of Singapore. Well Park Hotel Farrer Park was constructed while i was busy exploring other parts of Singapore (mostly the East) and in it i found Blue Jasmine, a Thai restaurant currently helmed by a petite female Thai chef! Classic Thai dishes are served here but regional specialties are also dished out here and i got to eat my favorite Esarn (Northeastern Thai cuisine) dishes! Start with the Cha-Om Fried Egg ($12), which is served rolled up at Blue Jasmine. The rolls of thin acacia leaves omelette is fragrant on its own but if you feel like it needs more kick, the classic Thai dip named Nam Prik Kapi based on fermented shrimp paste and fiery birds’ eye chillies will pack that punch you want. I loved this dish! We're used to Tom Yum and that's available at Blue Jasmine too. However, do give Sea Bass Poh Tek ($30), an Esarn style hot and spicy traditional soup, a try. 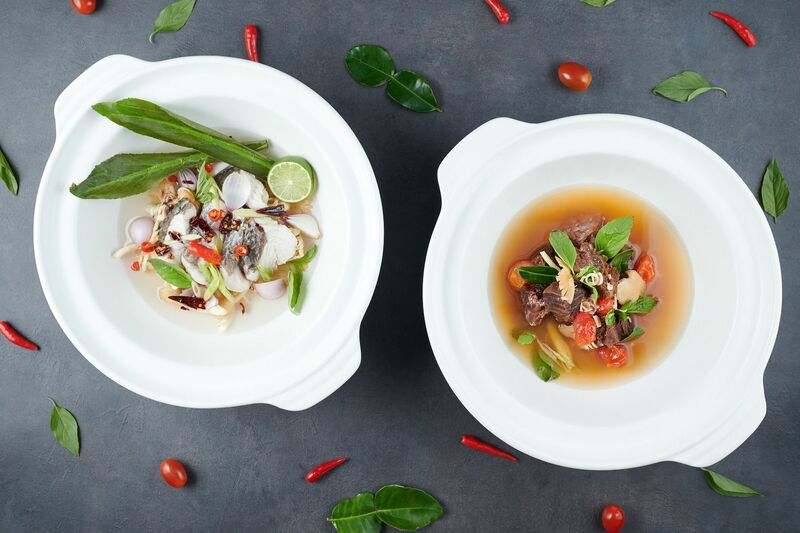 The flavour profile sounds similar to Tom Yum and could, in fact, be considered a type of Tom Yum but Poh Tek is made with a different proportion of spices and ingredients, with the addition of deep-fried sea bass, offering a different dining experience to the classic. Sweetness and a lovely spice. Love the refreshing aromatics. Firm fried fish with a light batter that isn’t too soggy either. Do not miss the Roast Chicken Esarn Style ($16), which is a double roasted chicken for that extra crispiness. Despite being cooked twice, it is super juicy. The marinate is made of an Esarn paste of galangal, lemongrass, coriander, garlic, turmeric, fish sauce and palm sugar, and is well absorbed by the chicken overnight. Accompanying the chicken is a spicy dipping sauce made with roasted glutinous rice with fried kaffir. The overall flavor is like that of a satay with moderate sweetness. Holy Basil KAPRAO (Squid, $24) is made for basil lovers. The fragrance permeates through every bite. 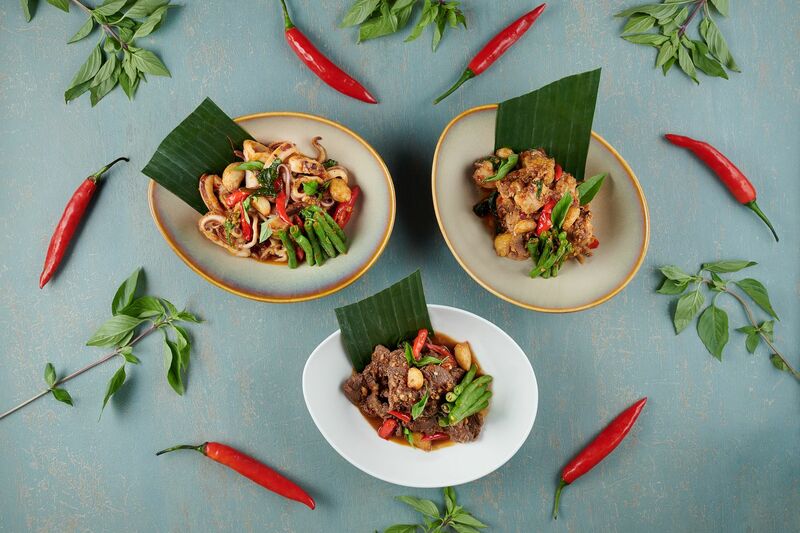 It's classic Thai stir-fry and you can choose to have the succulent squid, or even kampong chicken and beef ribeye. There are various curries available but do try the Yellow River Prawn Curry ($26). This exotic curry uses fresh turmeric and betel leaves, which gives it an herbaceous taste of South Thailand. I found this quite kid-friendly with the mild level of spice. Rice would be best vehicle to deliver the dishes into your mouth but the Thai Fried Kway Teow (Seafood, $18) is a winner if you need a carb dish. This tastes like the the local Char Kway Teow and the wok-hei is strong here! Of course, it has that pungent fish sauce to give it that extra umami. 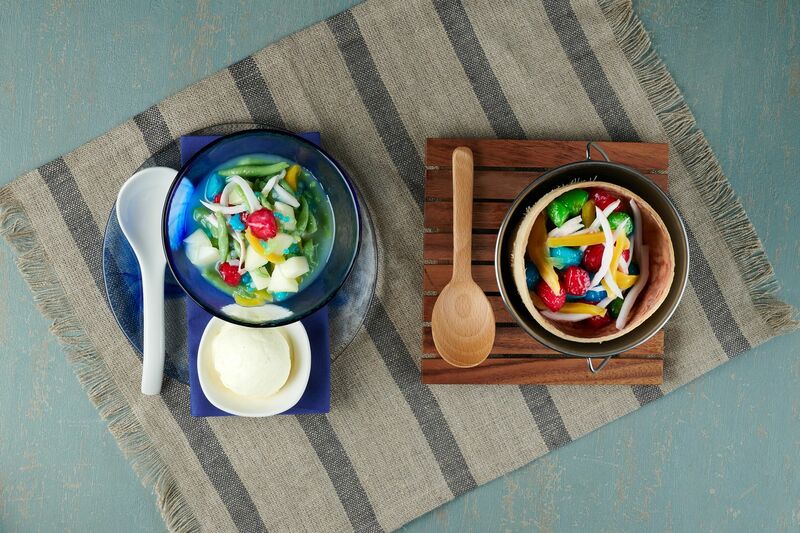 I would pick any of Blue Jasmine's desserts because they all have that rich coconut base, along with different toppings. If you want a piece of everything, the Thai Chendol ($12) has bits of honeydew, chendol, red ruby, jackfruit, and coconut ice cream. It's a rich dessert, but i love how the salted coconut cream balances the light sweetness from the fruits. Blue Jasmine is perfect for group gatherings of all sizes. I found it to be rather family friendly and the outdoor courtyard and pool space will also keep the kids entertained. Blue Jasmine is also halal-certified so that makes it great for work hosting too. For December, Blue Jasmine has lined up a three-day Crab Buffet on 6 - 8 December, followed by their Christmas Buffet on 21 -25 December, and the New Year's Eve Buffet on 28 - 31 December. Guests who elect to dine at the New Year's Eve Buffet will be able to enjoy a special price at the Countdown Party at the Pool Bar just a few steps away from Blue Jasmine.